This is the Spanish paperback edition of Hunting Badger, Hillerman's fourteenth Navajo Mystery novel featuring Joe Leaphorn and Jim Chee of the Navajo Tribal Police. This edition was published in 2001 by Editorial Diagonal del Grup 62 in Barcelona, Spain as part of the Gimlet collection. The text was translated into Spanish by Concha Cardeñoso Sáenz de Miera. The cover photo is by Cover/Photonica and features a desert scene with some hills in the background. 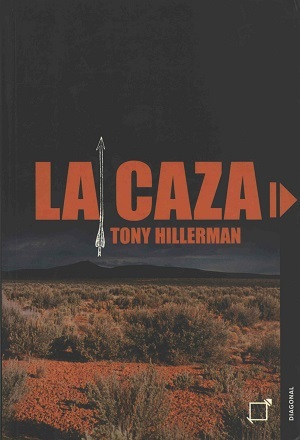 The back cover features a photo of Tony Hillerman taken by Barney Hillerman. There are also front and back foldouts. The front foldout contains a story synopsis and the back fold out contains a short author bio and praise for Hillerman's work. Format: Paperback, 23.3 x 16 cm. Binding: Paper covers with full color illustration. The author's name, title, collection name and publisher's logo are printed in white vertically on the spine.